Last weekend, Michelle Gregory at Beautiful Chaos created a special badge for those who’s helped her on the journey. 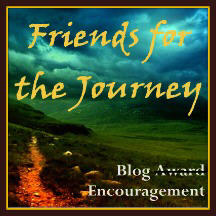 I was honored to receive the "Friends for the Journey" Blog Encouragement, and now it’s my turn to pass it along. I’ve deliberated about this all week. Crap, who do I select? Even worse, who will I leave out? So many of you have encouraged me, sent emails, left comments, read and featured my book… I finally selected, but if you’re not one of the seven, please don’t feel left out. You’ve all helped me so much! 1. Pass it on to 7 other bloggers and tell how they've encouraged you. 2. Please let your recipients know that it started at Beautiful Chaos. 3. Leave a comment on this post when you've posted on your blog. This woman never has a bad day – I don’t think it’s possible! She’s cheery and upbeat in her posts and comments. Kitty’s silly joy is infectious and her presence makes everyone’s day just a little brighter. You make me laugh, Kitty! And often when I need it the most. Lee’s pushed me with blogfests and challenges. He’s pushed me with my writing. (Dude, CassaStar’s sequel takes place on a planet and there’s a RIVER – water issue solved!) Lee goes to great lengths for his blogging buddies and for the whole community, and I appreciate his efforts. We’ve faithfully visited each other’s blog since last year’s A to Z Challenge. Yvonne doesn’t listen to my type of music or watch my kind of movies and I have no idea how to write a poem. But our friendship is formed out of mutual respect and admiration, and Yvonne is the most devoted person I know. And the woman loves playground slides! How cool is that? Edi was part of my blog tour last year with a review and feature. And he could’ve just left it at that. But he’s continued to support and encourage me, often inquiring of the sequel. Edi, I really, really appreciate that! He’s plugged my book, my trailer, my site – he’s the Dude! His commitment and enthusiasm keep me going and he always knows when a friend needs a boost. It will be an awesome honor when his first book comes out for me to return the favor! Lynda is the type of person I’d call a quiet, stable presence. Both of her blogs are encouraging and her comments reflect that spirit. I always look forward to your positive words, Lynda! Patrick Tillett Patrick is one of those individuals who doesn’t make a big splash and sometimes flies under the radar. But he’s consistent and steady, like a giant rock in a raging river. 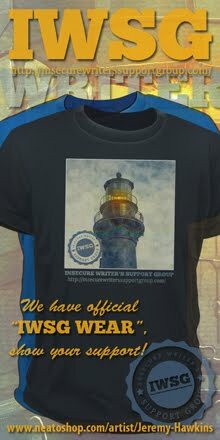 Dude, your support has not gone unnoticed and I appreciate it! Who’s encouraged you on your journey? And yes, the next gen iPad March 11 – I am so there! Thanks for the mention, Alex! It's an honor, and I too am looking forward for the day my first novel is released! What a cool award!!! I'll have to check out the bloggers I don't know that you mentioned! A next gen Ipad? COOL! Great award. I'm checking out your awardee's! I look forward (?) to the A to Z challenge with you next month. You're welcome, Jeffrey - and thank YOU! Thank you very much Alex for the award, I feel happy and honoured to recieve it and will show it with pride on my page. My late husband was a great fan of Star wars and Star Trek and would have loved your taste in films, as for music if we all liked the same it would be a dull world, for a start everyone would be listening to Daniel and I wouldn't be able to get concert seats. My children#s slide rides just goes to show I am still young at heart perhaps I ought to act my age .........but somehow I don't think I would or could pass a slide by......yet. What a creative award, beautiful and well earned. Beautiful award - both the sentiment and the look of it! Congrats! Congratulations to the recipients - they all deserved the award! I have to say Old Kitty has also been a constant source of encouragement and cheerfulness for me. She is the best! Alex, this is such a nice way to forward an award, by explaining why you chose the folks you did. So often, awards are forwarded via there a list of links, and gosh, if I had time, I'd click on them all, but I don't. Your extra words made me stop. This time I will take the time to explore the blogs on your list that haven't read before. Congrats to the winners. The award is beautiful! Do you have a first gen iPad you need to get rid of to make space for the 2nd gen? Lol! Yvonne, don't want to make it difficult for you to see your Daniel! Liza, thanks. This was more than just an award, so I felt explaining the reasons for each selection was important. Kristin, I do have an iPad and soon I'll be enjoying TWO! congrats to all the recipients. i know how hard it is to narrow down the list. Thanks Alex. It's always good to receive a word of encouragement in this sometimes lonely world of blogging. You have so often been there providing me mutual support and I appreciate that. Also...thanks for sticking with me even through my sporadic period. Congrats on your award. It's well deserved. Awwwwwwwww I am BLUSHING!! SO gone betroot red and fanning myself!! I've not felt so hot since getting betwixt Byron and Bassa. Alex, lovely, just lovely. It is so important to honor those who help us on our way. It's hard to find a more supportive community than the community of blogging writers. Ooh, tell us how you like the new iPad! And congrats to you and the new award winners...they deserve it. All great bloggers. Neat award- and those you picked deserve it! Have a great weekend Alex! Congrats to you for receiving it and thanks so much for passing it on to me! I already know a couple of the other folks you gave it to and I'll to check out the others. Aww this is such a sweet post, it's lovely to see you talk about who's helped you along the way! Everyone is talking about the new iPad. I only just got the current one, so alas, no new model for me! Congrats on the award! Those are some great blogs. They would be ones I choose that have helped me on my way. Michele, I knew you'd be back full force soon. And I'm finishing revisions right now on the sequel. Kitty, once again you have me laughing! Sangu, that's okay, you're still cool. Thanks everyone and damn this was difficult! What an awesome award -- congrats on receiving it and on passing it on with so much heart and gratitude. Have a fantastic weekend!! Congrats - and congrats to the everyone who you've passed it on to! So so many people have helped me. I'm not sure I could even begin to choose! What a nice award! Congratulations to you and to those whom you passed it along to. It's so wonderful how the writing community supports one another. Awe wow! What a beautiful sentiment!! Suzie, we don't do it alone. Congrat's. Stopping by from the A-Z blogging challenge. Looking forward to participating. Like your blog and now a follower. Congrats! They are all great people. Oh wow, thank you so much! I'm deeply honored. Your post demonstrates how important it is to pass it on. Most of us received lots of help and enouragement from friends and colleagues. I hope I've helped some people the same as so many helped me. What a nice tribute, Alex.... very touching. One person comes to mind and I mention her often at my blog. Erica Olson from erica and christy. Another person who comes to mind in my critique partner Josh Jacobs. A super patient guy who worked with me for three months line editing my first novel. There are others of course, but these two fantastic people were there for me in my first writing endeavor. Susan, we can't do it alone. And it's important that we recognize their efforts! Sounds like you've had lots of help. Alex, looks like a great list! I follow a coupld of them but thenks for pointing me in the direction to check out a few more. Very nice, Alex. Great job. I award you six of your favorite cupcakes to be topped with the icing of your choice, and teleported to you kitchen table. What a beautiful award! I love the spirit behind it. Good work Beautiful Chaos! The best people to encourage me along my writer journey have been Christine @christinebryant.blogspot.com, Elana @elanajohnson.blogspot.com, and Christine Fonseca @christinefonseca.blogspot.com. Couldn't do it without them. And so many others, too. Kudos to you, and a FINE list of recipients! Whisk, I always appreciate food! Ali, I know - tough to decide. Nice award -- a great way to thank those generous souls who help along the way. Congrats to your winners, and to you for being one of those generous people who earned the award, as well! please apologize the delay in my answer. I have not been online in the past two and a half days. Thank you so much for selecting my blog. I'm busy finishing a review. Need to think about which blogs to select. You're welcome, Edi. And I know you're a busy dude!